A high gloss thick faux marble top along with traditional bail hardware with rosettes in a nickel color finish make this dresser and mirror set a great looking storage group for your bedroom. Keep clothing organized in the drawers and display your favorite accent items atop the dresser. Side roller glides make the drawers easy to open and close. 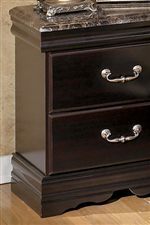 With this dark merlot finish dresser you will love the new look for your home. The faux marble trim on the mirror adds a touch of color and style. The mirror will help make your room feel more spacious and ease your morning routine. The Esmarelda 6-Drawer Dresser with Faux Marble & Mirror by Signature Design by Ashley at AHFA in the area. Product availability may vary. Contact us for the most current availability on this product. Add timeless elegance to your master bedroom with the Esmarelda bedroom collection. A rich dark merlot finish flows elegantly over the deeply shaped Louis Philippe style moulding. High gloss thick faux marble accents the headboards and footboards of the sleigh and storage panel beds as well as the tops of the bedroom storage pieces. Stylish nickel color bail hardware with rosettes to capture a sophisticated atmosphere. Side roller glides for smooth operating drawers. You will have a traditional classic for your bedroom with the Esmarelda collection. The Esmarelda collection is a great option if you are looking for Transitional furniture in the area.